Whirl from the Freezing Pond is the fourth mission of Snowman's Land in Super Mario 64 and Super Mario 64 DS. The objective of the mission is to reach the ledge beyond the freezing pond. Past the freezing pond with the Spindrifts in the course is a ledge that is too high to jump over normally. 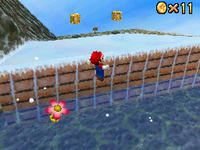 Jumping onto one of the Spindrifts in the water will send the player in the air and starting spinning, allowing them to get over to the ledge. If the player is playing as Luigi, using his backflip will have the same effect. Once over the ledge, the ! 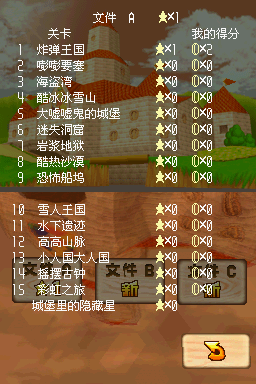 Block on the left contains the Power Star. This page was last edited on September 21, 2018, at 08:53.